Witness “Sin-fluential” tales from the brutal pages of vintage crime comic books – exposed! – uncensored and LIVE! 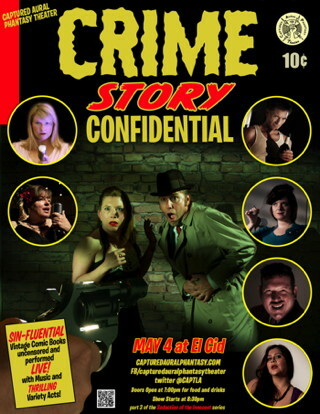 Captured Aural Phantasy Theater presents the CRIME STORY CONFIDENTIAL show at the historic El Cid for one night only Sunday, May 4! 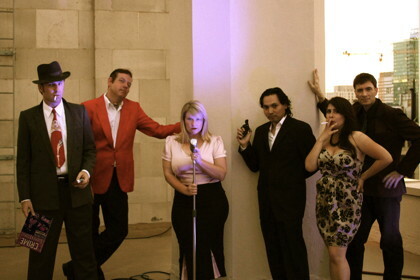 They will be showcasing live performances of stories pulled from classic, mid-century crime comic books presented in their signature variety show / old radio show style. Be advised, these aren’t heart-warming tales – these are the bloody comic book crime stories that were burned in the 40’s and banned in the 50’s for being too hard-boiled, too violent and too much! Along with multi-media comic book performances, the evening includes comedic acts, prizes and the finest live music by Laurel and their super-talented friend Adriene Biondo. The CRIME STORY CONFIDENTIAL show is another in their new Seduction of the Innocent series, monthly shows that highlight comics once deemed harmful to kids. The series commemorates the 60th anniversary of the Senate hearings of April 21, 1954, which damned the comic book industry. 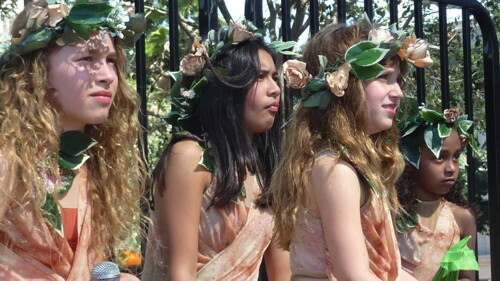 The CAPT crew will be re-staging this historic event with a special theatrical performance later in the spring. In the meantime, get the backstory and enjoy their “bad influence” at El Cid. All the cool kids are doin’ it. Comic Book Hideout, Junk for Joy and many others! Captured Aural Phantasy Theater is a group dedicated to producing high-quality live, filmed and recorded entertainment; bred in Chicago, but in L.A. to stay. Captured Aural Phantasy Theater is the original comic book / radio / variety show based right here in L.A. for over 5 years! omg, thank you so much for posting this! Super Marvelous!